Led by WindEagle Kinney-Linton and Hope Langner in Abiquiu, New Mexico. As I enter 2020, what is my dream of myself? How do I really know myself? Who am I becoming as I step into the next decade? We loved the metaphor of the Phoenix as we all have had experiences of finding we need to journey more deeply into the self to remember our own way of being and the gifts that we carry... and sometimes it is coming from the ashes of our previous experiences that we find the deepest discoveries and even the gold that is buried there. In this ceremony, we will experience the unfolding of our wings to reveal our deepest essence. We will co-create with nature, honoring our intention to step into the fullness of our being. Ceremonial experiences and teachings will take place in the medicine wheel and on the land and will include visioning, dreaming, art, journaling, contemplation and deep conversation. We will offer some of the ancient ways that open pathways leading us to see into our own life mirror, illuminating where we are and calling us to vision our future. We are not always aware of the traps or patterns that we walk, or what we consciously need and want as ways to balance our lives and ways of being. And at times, our self care is set aside while we take care of everything else in our life first. We will open each of these pathways with reflection in our morning hours, while working with different forms of art and beauty in our afternoons. All of which will lead us toward stepping into our own ring of power. The final day of this retreat will be a high ceremony day, culminating in an experience of magic by the night fire, dressing in the essence image of our true spirit manifestation. Dates: Arrive on Saturday the 21st of September by 5:30pm, in time to settle in your accommodation and share dinner together. Program: We begin on Sunday morning, September 22nd and will complete mid-morning after a breakfast feast on Friday, September 27th around 11:00am. Space: This gathering is limited to 16 participants. Registration: Please email institute@ehama.org to reserve your place. 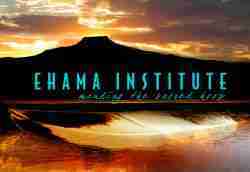 A deposit of $650 is due on May 1st, 2019 and may be received at https://www.ehama.org/payment.php Remaining funds payable by August 15th. Transportation: We are 2.5 hours from Albuquerque Airport. We have a local shuttle that operates out of this Village, which can be arranged for transport from the airport to the land and back. For inquires, please contact: Kevin Spitzer at info@whitebuffaloshuttle.us. Alternatively, people may rent their own vehicles at the airport. Accommodations: We have different options for lodging including our neighboring Stardance with group space,local camping and local Airbnb homes. Due to the busy season, reservations are highly recommended with your registration on May 1st. Information will be provided upon registration. Cancellation policy: If you cancel 30 or more days prior to the program start date, payments made will be refunded in full, less a $50 processing fee. You may also transfer your registration to another person at no charge. If you cancel within 30 days of the program start date, no refund is available unless we are able to fill your place. In that instance, you will receive a full refund less a $50 processing fee. WindEagle is a Keeper of ancient wisdom called the Origin Teachings of the Delicate Lodge. She is dedicated to peace building, awakening consciousness and healing separation in our world. She is the co-founding Director of Ehama Institute and the World Foundation for the Discipline of Peace. She lives in New Mexico on a red earth canyon when she is not traveling and teaching. Hope is a seasoned trainer and master certified coach. Known for her heart, calm presence, and laser-sharp clarity, Hope believes that inner alignment is the path to personal, organizational and cultural change. For many years, Hope has been exploring different modalities of healing that incorporate attention on body, mind and spirit. Her learning journey with the Delicate Lodge Teachings and the Beauty Way has been deep and transformative.